What Do Goldfish Eat Besides Flakes? 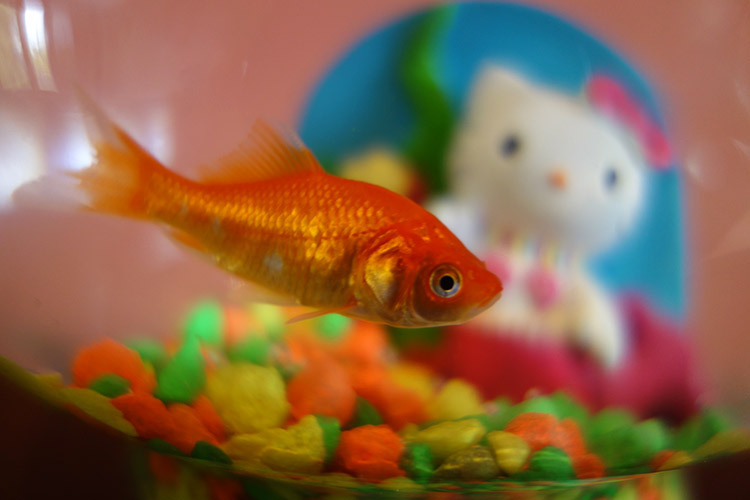 Commercial diets for goldfish are commonly in the form of flakes or pellets. While commercial food is acceptable goldfish enthusiasts understandably want to spice up the diet a bit. Because goldfish have sensitive digestive systems adding some healthy, fibrous foods to their diets can help minimize the chances of getting dropsy. Otherwise known as a fancy carp, goldfish are omnivorous. They eat a wide variety of aquatic plants and animals in the wild including worms, small crustaceans, larvae, insects, and other fish. However, wild carp are much larger than a domesticated goldfish. Feeding your tiny pampered swimmer a wild carp’s diet would not be entirely appropriate but you can feed them some fresh or human grade foods. Wild carp love to nibble on pond plants and algae. Growing living plants such as anacharis in your aquarium provide the fish with a place to hide and something tasty to eat. Drop a piece of cooked bok choy (about a square-inch) in the tank and watch him chew on it. Give him a couple of cold, boiled peas. Other gourd plants such as cucumbers, melons, and squash are good choices but cook the squash first. Monitor their intake – you don’t want them to eat too much. After they’ve eaten their fill scoop out the uneaten fruits and veggies to avoid an overgrowth of bad bacteria. Naturally, goldfish love worms. Viral videos capitalizing on the yuck factor show tiny goldfish consuming entire earthworms. While they obviously relish worms it’s not recommended that you feed them live animals. First, live worms are hosts to a range of parasites which will most certainly be passed on to your fish. Second, your goldfish has a very compact cavity in which its digestive system sits. Overfeeding your fish exacerbates their finicky digestion. Even catching worms, larvae, or insects and chopping them up (besides being utterly disgusting) doesn’t take care of the parasite factor. If you do choose this method of feeding your goldfish hopefully you keep these utensils separate from the ones you use to prepare your own food! A better way of introducing high quality animal protein to their diets is to give them freeze-dried brine shrimp – blood worms and mealworms sold in pet supply stores. These foods come in sizes that your petite goldfish can handle and the processing method eliminates germs and parasites. Meat of warm-blooded animals is not recommended. It is high in fat and hard to digest leading to fish bloat. Many fish enthusiasts claim that your goldfish must have fresh fruits and veggies for a long and healthy life. This may or may not have been substantiated so don’t feel bad if you only feed them manufactured fish food. It’s better than risking the chance of feeding your fish harmful food. With that said choose a commercial food that contains no fillers. If you don’t like the idea of pellets or flakes, gel food is another way to easily feed fish. It comes in a powder form and you cook it at home. It becomes Jell-O for fish and you administer it in small cubes. It doesn’t break apart because it is already moist. Because it contains insect and worm protein, you may want to keep your cooking utensils separate! The Nest: What Do Goldfish Eat Besides Goldfish Flakes? BioKids: Carassius Auratus – What Do They Look Like?